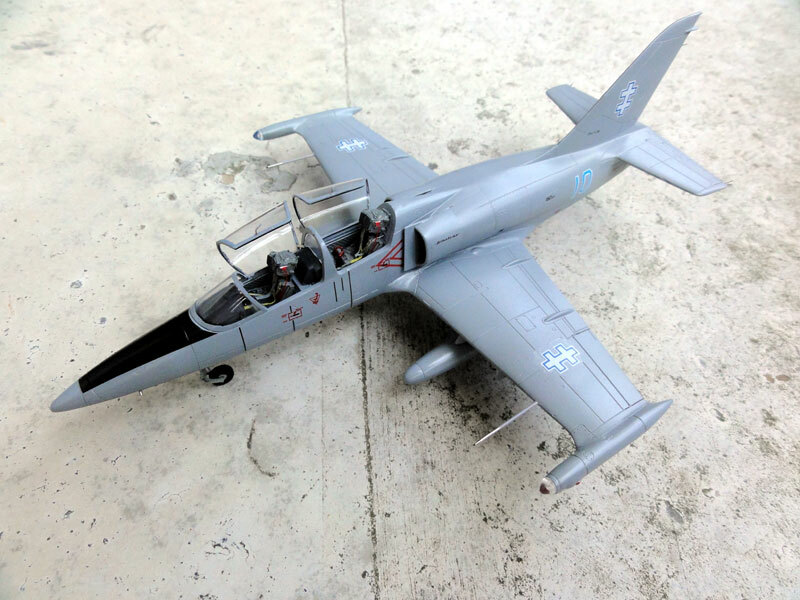 But additional kits were bought of this very nice Eduard L-39 kit and its basic construction has been described on page 1..... A number of models will be made. 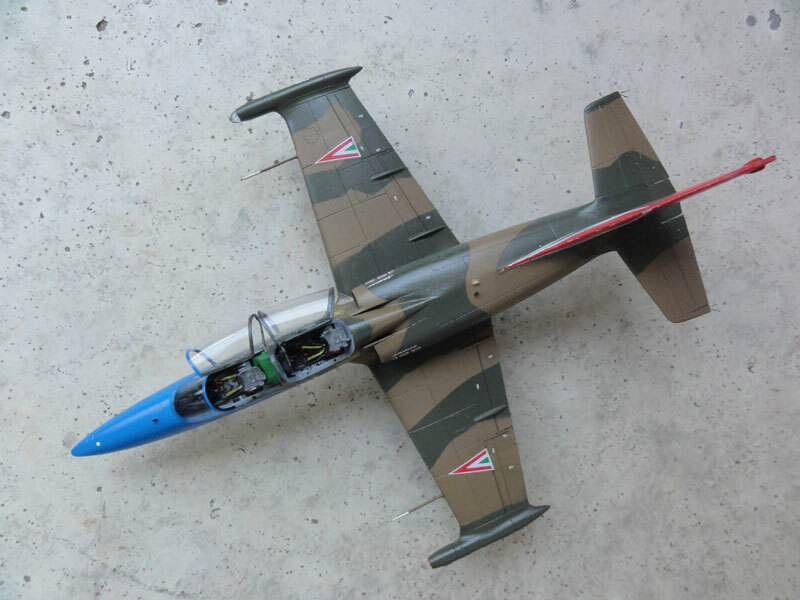 The Eduard kit #7416 for a L-39ZO was finished in a scheme for Lithuanian Air Force. The national markings came from a Hi Decal Line set HDL 72-019. Colour scheme is very simple with an overall grey scheme. Used was probably grey FS36306 for which Gunze Sangyo 307 acrylic paint is accurate enough for me, it was applied with the airbrush. The cockpit canopies would be set open, so adding some extra details in the cockpit is worthwhile. So resin seats came from PAVLA. Remarkably, the Eduard seats of the kit are very large and too high, so indeed these are better replaced. The canopy frames were also painted and on each canopy a fixed handle is seen so 2 in total on the port left sides, these were made from thin sprue. Also, the canopy actuators were added inside from metal rod. The windscreen was painted and got a black anti-glare panel. The wing leading edge pitot tubes made from metal needles. A couple of fuel tanks were installed from the kit. 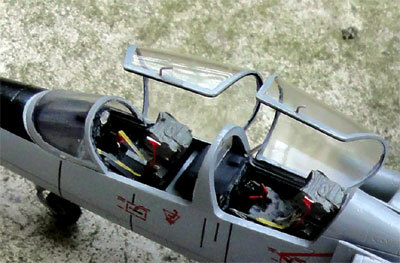 I could not really see if the wing tip tanks had anti-glare panels, so did not apply these. Other kit finishing was similar as described for the other models with a dull varnish coat. Final installment was the undercarriage as well as some small antennas. Adding static dischargers completed the model. 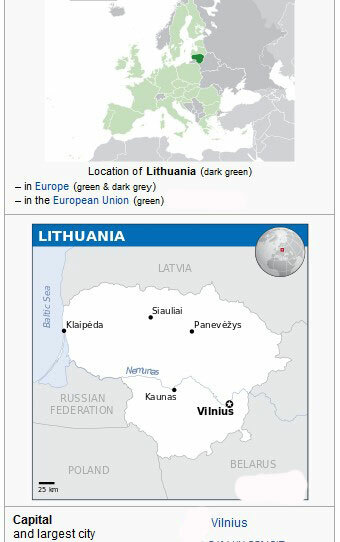 Lithuania became independent again after the collapse of the Soviet Union in 1991. The Lithuanian Air Force is the military aviation branch of the Lithuanian armed forces. The country joined NATO in 2004 and regularly NATO provides air defense patrols. The small air force has about a dozen light aircraft at bases such as Šiauliai, Radviliškis and Kaunas. 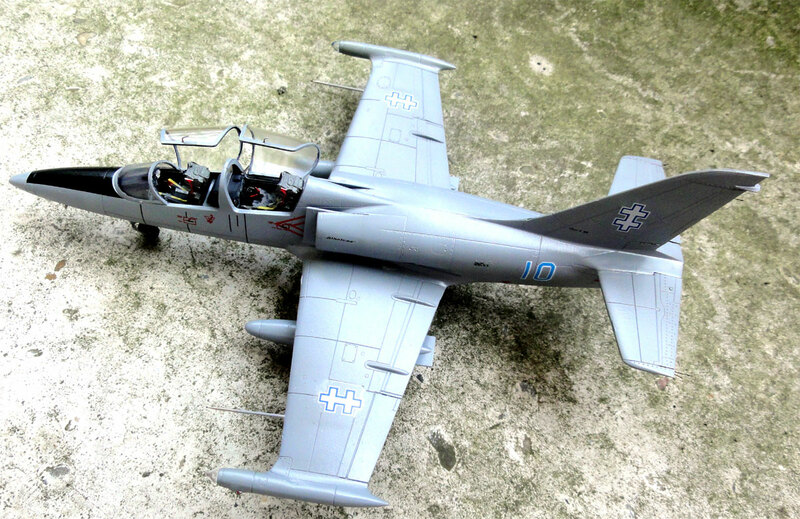 Two L-39ZA were acquired after these were modernized in Romania in 2007. The aircraft are used for training control officers and based at Šiauliai. 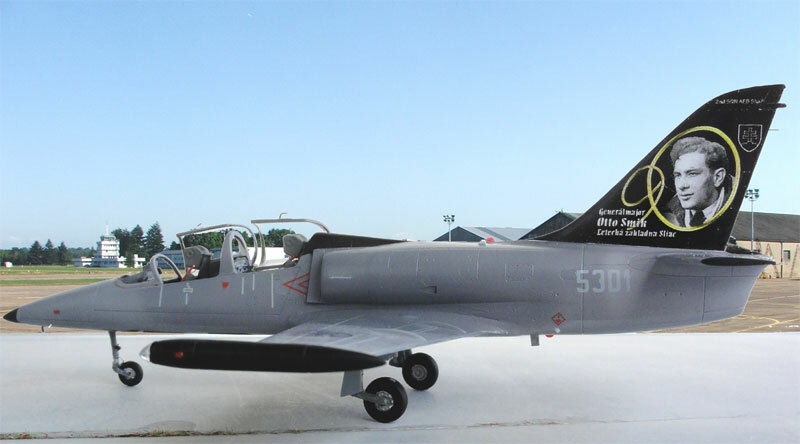 L-39ZA Lithuania Air Force at first aviation base at Šiauliai in 2010. Another Eduard kit was made. 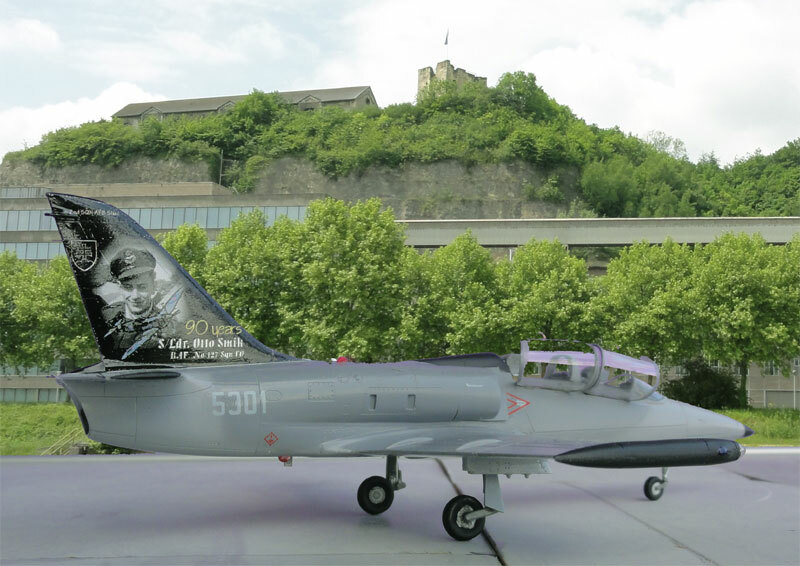 It was to be finished as L-39CM trainer in a scheme for the Slovak Air Force. 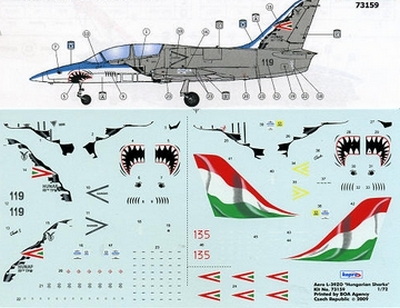 Decals came from Model-CZ decalset MCZA72004 with special markings on the tail. The national markings are "toned down" with grey outlines. than followed after masking by FS36270 using Gunze Sangyo 306, and next the pattern on FS36118 using Gunze Sangyo 305. 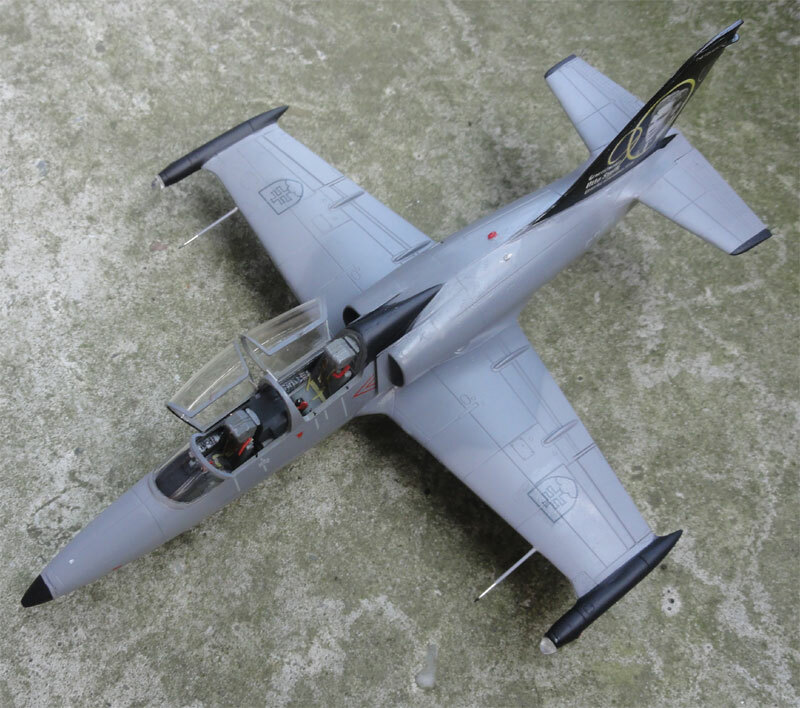 Several black areas on spine, anti-glare and tail leading edges, stabilizer tips and wing tip tanks. The model was finished with various details as well as the model described above. Seats came from PAVLA. Additions are also anti-collision light and smaller antenna on the spine. 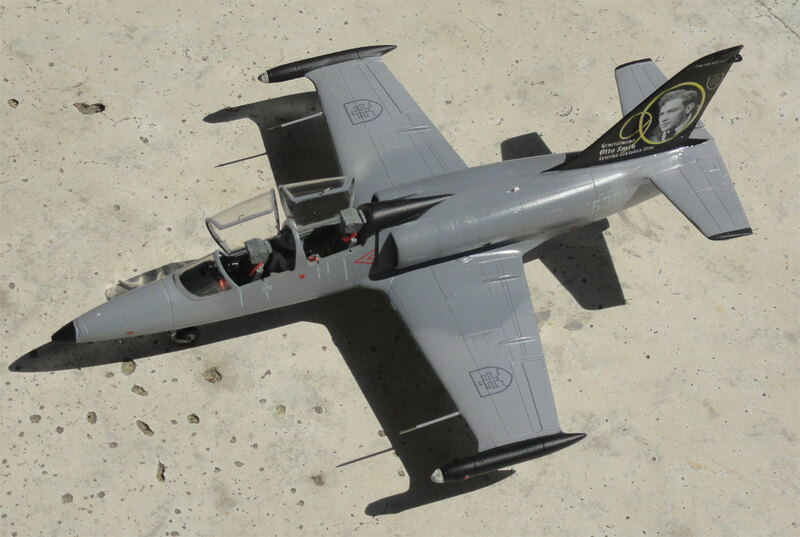 The L-39CM is a trainer, so the model was kept "clean" with no underwing pylons nor stores. 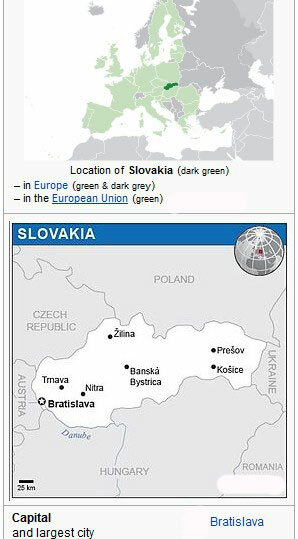 Slovakia became independent again after the collapse of the East Block with the split with Czechia in 1993. 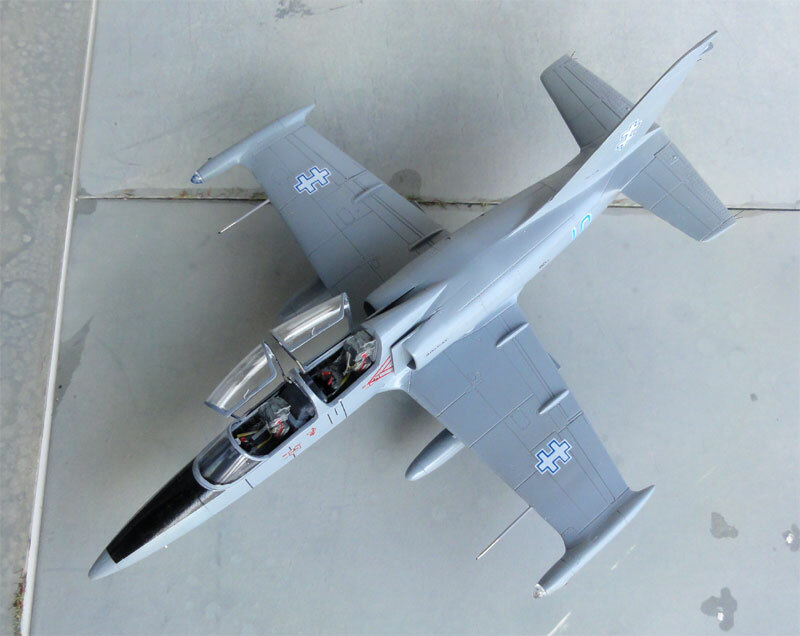 The air force aircraft were split as well. 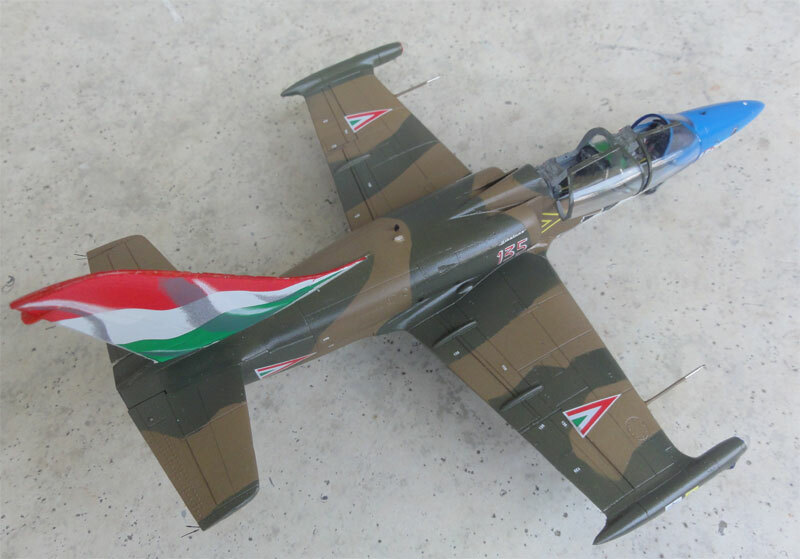 The Slovak air force now has a number of aircraft like L-39 Albatros attack aircraft and trainers and MiG-29 fighters along with some transport aircraft and helicopters. Most L-39 aircraft of 2. 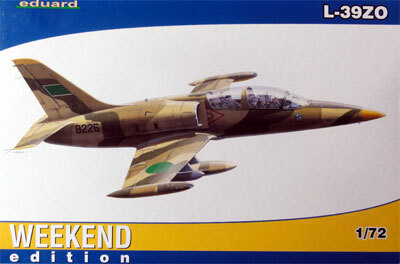 "Letka" are based at Sliac air base in mid Slovakia. 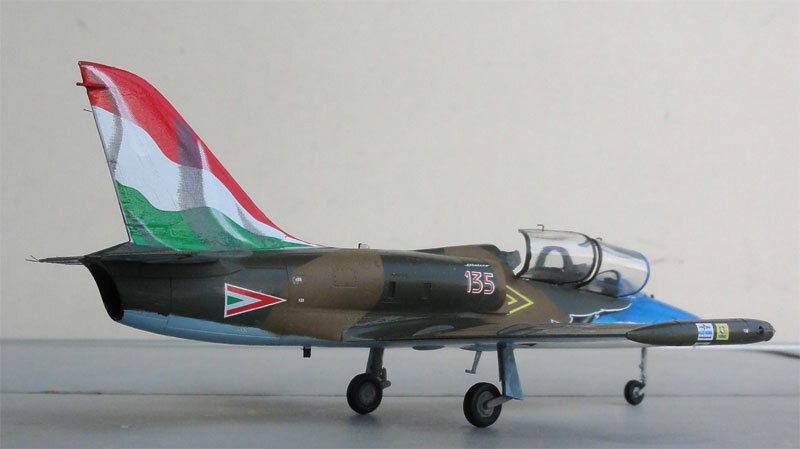 Another Eduard kit #7418 for a L-39C was made in a scheme of the Hungary air force. 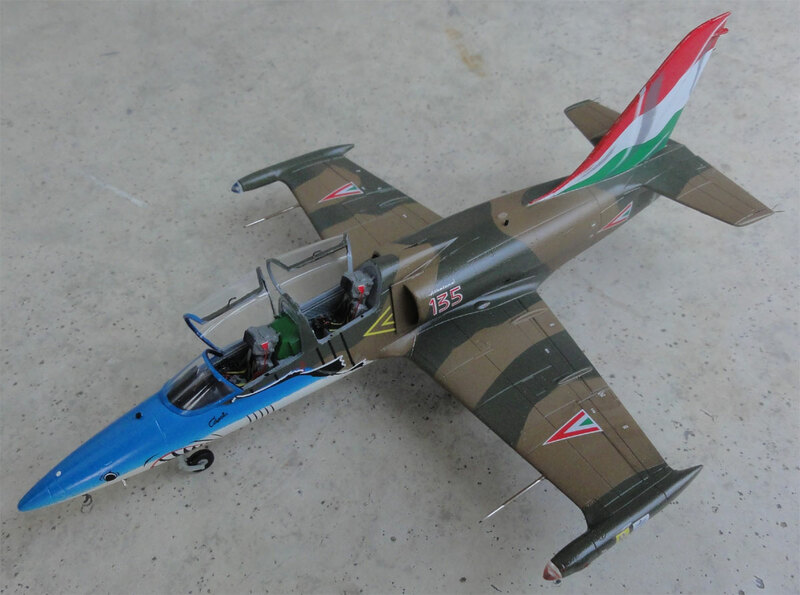 I had from a KoPro kit #73159 (which is the old KP kit) very nice decals for a L-39ZO of the Hungarian Air Force for 2 nice schemes. It was decided to put these decals on this Eduard kit. 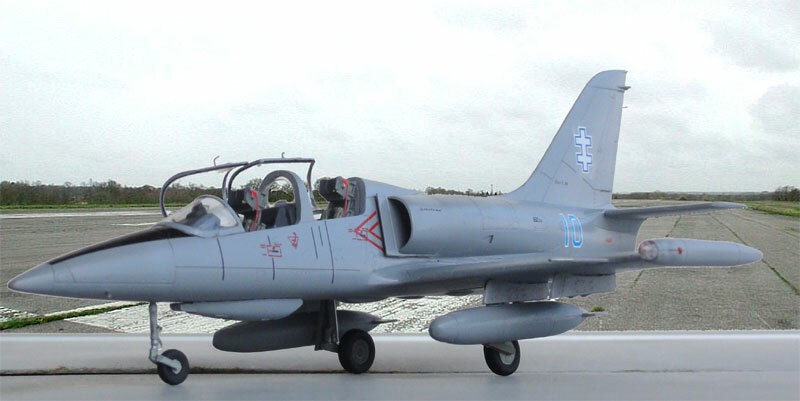 The scheme B is for a L-39ZO coded "135" Capali as seen at the Kecskemet air show in 2007. It required masking of several colours. I made a paper copy of the decal sheet and used this as pattern for masking. This is important to avoid a sort of over flow as the decals should conform to the camouflage pattern outlines. 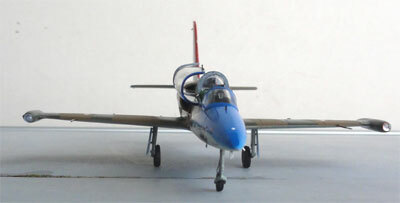 The blue pattern on the upper nose was airbrushed with Gunze Sangyo H25 blue. 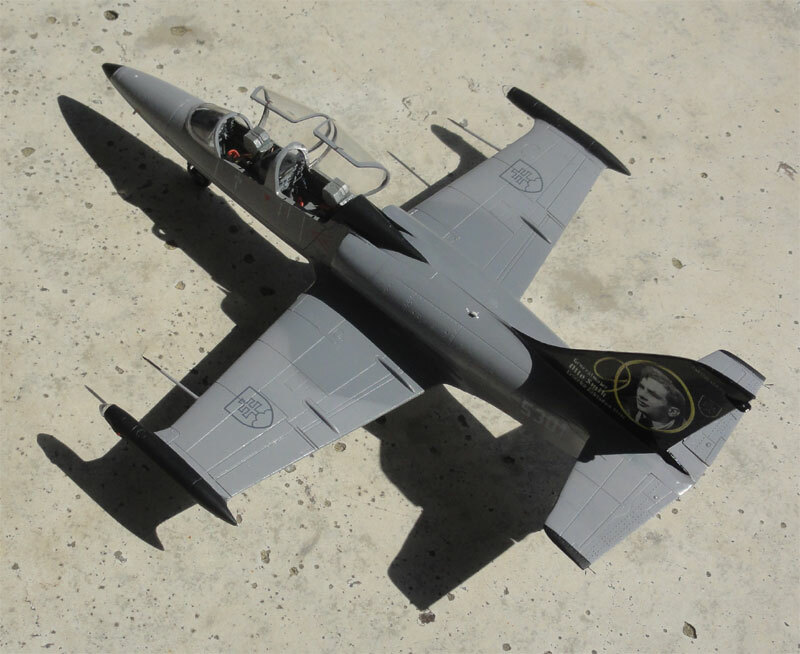 It is not solid but blends into the lower white fuselage. The various smaller anti-glare panels were airbrushed matt black. The decals themselves are very thin, so take care here. The nose shark teeth decal was cut in half and trimmed to fit better. 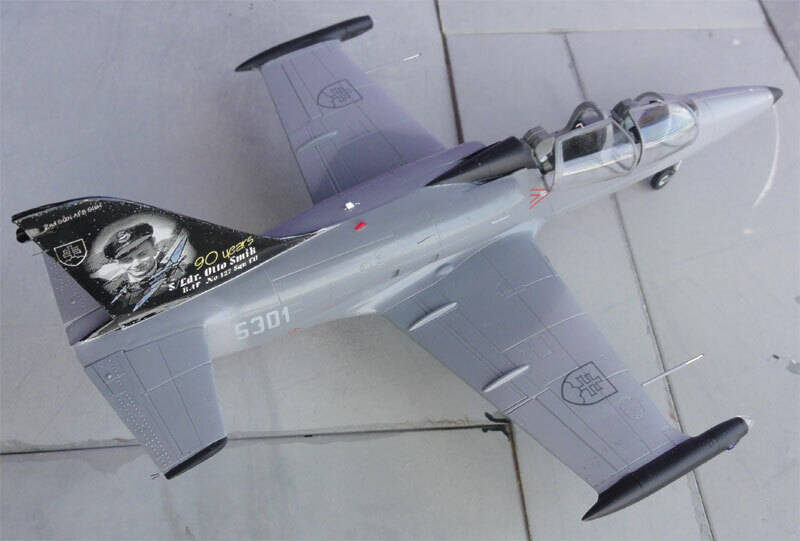 The tail edges were also painted red to match the decals. 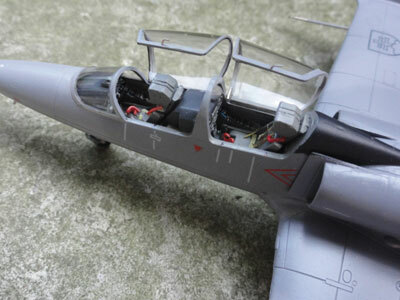 The cockpit got PAVLA resin seats and some other details made from scrap as the canopies were set open. The model was finished with various details as well as described for the models above. Hunga'y's borders were first established after the end of World War I in 1920, before that it was in the Austro-Hungarian Empire. After the Second World War, it became part of the Communist Eastern Block with armed forces through the Warsaw Pact. Large numbers of Soviet aircraft were used by the air force. After the collapse of the Soviet block in 1989, several Eastern Europe countries gained real independence. 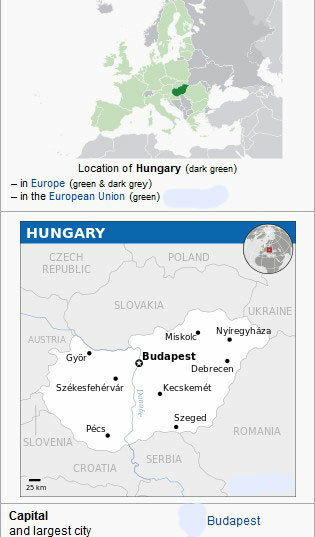 Hungary is now a NATO member. 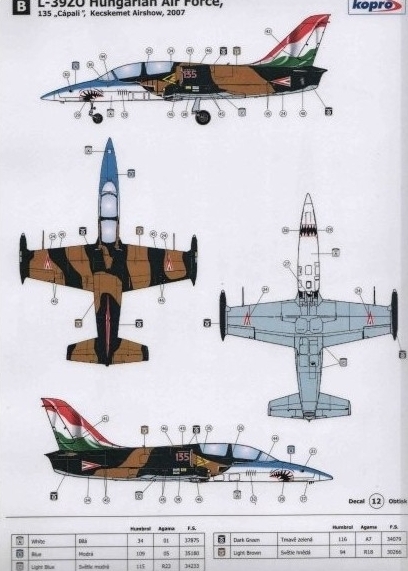 The Hungarian Air Force ("Magyar Légiero") is a relatively small air force with the newest JAS-39 Gripens (with some 16 Gripens "leased" that replaced the MiG-29). Some utility and transport aircraft are also used as well as various helicopters. Main bases are at Kecskemet, Szolnok and Papa (where also a small NATO transport detachment with Boeing C-17 is stationed). 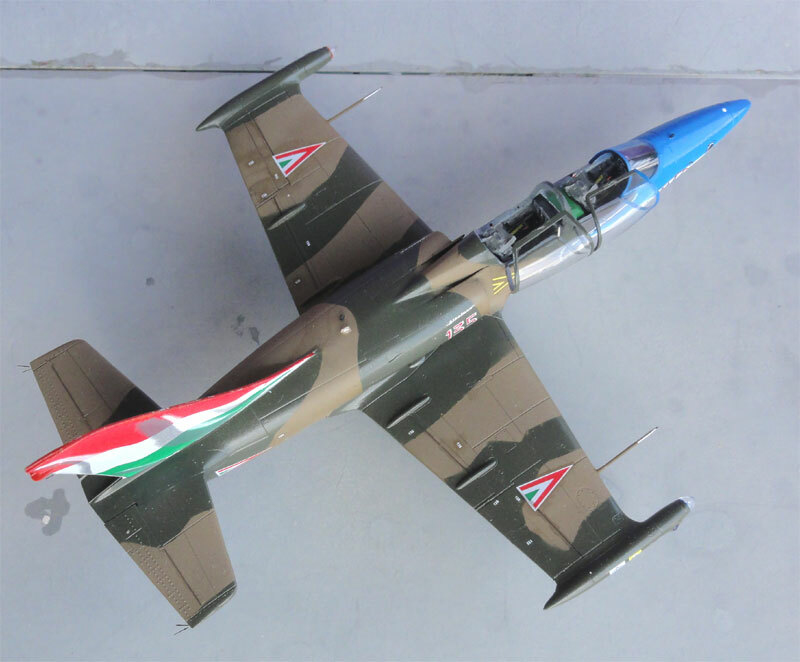 Aero L-39ZO of the Hungarian Air Force ("Magyar Légiero").